And so on- so we are just adding the last 2 digits in the sequence. 0 1 1 2 3 5 8 13 21 34 55 89 144 and so on. What this does is (after the first few numbers in the sequence) is it creates a ratio close to 1.618- also known as the golden ratio. This ratio can be witnessed in everything such as the human anatomy, plants, flowers, the universe itself and even successful companies are well known to use this ratio in the design of their products and logos. If god or your representation of what you would call a creator was a number, that number would be 1.618. Now this article is not about the fibonacci sequence as we know it, there are hidden codes within this sequence that I will speak about in the future, but for this article I wanted to talk about if we start the sequence with 33. So you may ask what is so magical about this sequence and the first clue starts with the number 33, as 33 is the start of this sequence. From a numerological standpoint 33 is incredibly powerful. 3 is mind, body and spirit, with 33 representing this in the physical and spiritual realm. 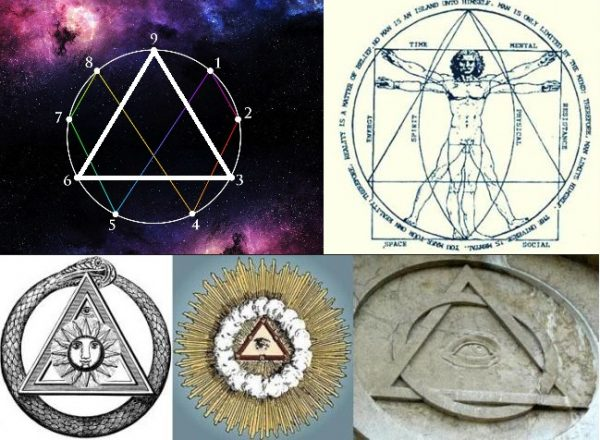 3+3 also makes 6 which is god or the creator. But what really triggered this code for me was the fact that we can derive the number sequence 3-6-9 from 33, as we have the obvious 3, but also 3+3 is 6 and 3×3 is 9. 3-6-9 represent ascension, which is the act of rising into an important position, but 3-6-9 has a lot more than just a spiritual meaning. So all numbers within this code are 3, 6 or 9. Once you map out these 3 numbers on a 9 pointed grid like the one below you get part of a code and the shape of a triangle. Again giving the infinite code of 1, 2, 4, 8, 7, 5. The combination of these 2 codes is depicted in the work of Leonardo Da Vinci’s Vitruvian Man. See image above. This is the code Tesla thought could be the solution to creating free energy. With recent changes to social media algorithms it is getting more and more difficult for our content to be seen, please share this article to help support independent media!